A native Mac audio and music player that supports crystal-clear bit-perfect gapless playback of all popular lossless and lossy audio formats, uses only a tiny amount of computing power and offers a clean and intuitive user experience – it only ‘does what it says on the can’. Uses a barely noticable amount of computing power, Colibri is built using state-of-the-art Swift programming language while the BASS audio engine is bundled as machine code and the interface uses built-in components by Apple. This was done in order to achieve a tiny footprint and to be as native to macOS as humanly possible. Colibri supports the most widely used range of file formats in terms of lossless audio: FLAC, ALAC, WAV, AIFF, APE, TTA, DSD, WavPack, popular lossy formats: Ogg Vorbis, MP1/MP2/MP3 and AAC/M4A, network streams/online radio, MOD and MIDI files (with per song SoundFont support)! For your undisturbed listening pleasure, Colibri supports Exclusive/Hog mode as well. A lossless audio player at heart with love to other popular formats as well. Complete Cue sheet support: malformed and disordered content is reprocessed during loading along with a painless and quick way to add your whole collection – Colibri will analyze and decide whether to load the Cue sheet in the folder or queue every song one by one for every added/dragged folder recursively. Extensively designed from the ground-up to provide a true gapless listening experience. Colibri prepares the upcoming song for playback in the background to further eliminate gaps for (slower) external drives or network shares without pushing the entire song into memory, meaning that no extra CPU or RAM usage is needed! Saves or empties your current playlist upon quitting and re-opens your songs when you start it up again. Furthermore, Colibri can also save and load its’ current playlist to a custom format that can even be appended to an already existing playlist. Loading and appending is also available for M3U and M3u8 playlist files. Colibri does its’ best to avoid most problems before, during and even after playback. Loading unsupported files show up as an error message and files that have disappeared since loading are automatically removed and skipped upon being reached in the playlist. A Mac lossless player developed with flexibility and error correction in mind. 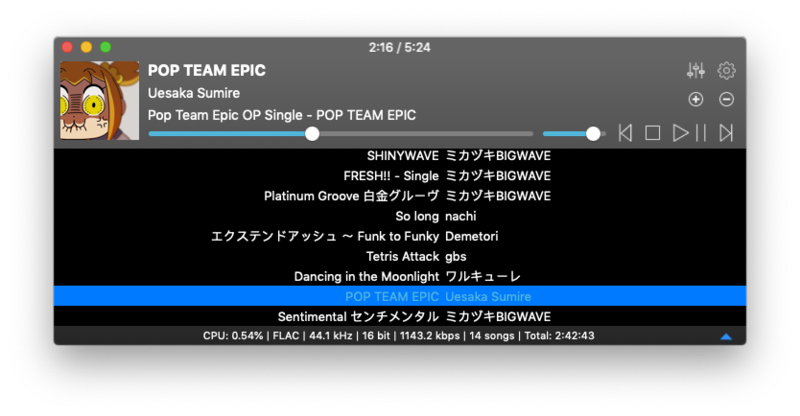 Capable of rendering the song information as it was intended to be shown: of all the tried metadata it had no problem with displaying Cyrillic or kanji/katakana/hiragana characters mixed with ASCII. All known metadata types readable by the BASS engine and macOS are supported by Colibri. Colibri does not phone home, collect usage data, spy on you or modify files in any way. It also does not contain DRM routines, have features hidden behind a paywall or bind functions to a subscription model. Colibri is an audio player that respects your privacy to the fullest and this will never change. Displays embedded cover art for FLAC files and ID3 / iTunes artwork metadata (mainly for ALAC / M4A and MP3 files). When that yields no visible results then Colibri looks around the folder where the current song resides for a cover art image and shows that. See the FAQ for details on the exact files Colibri looks for. FLAC files with embedded picture data or supplied album art images are displayed automatically. 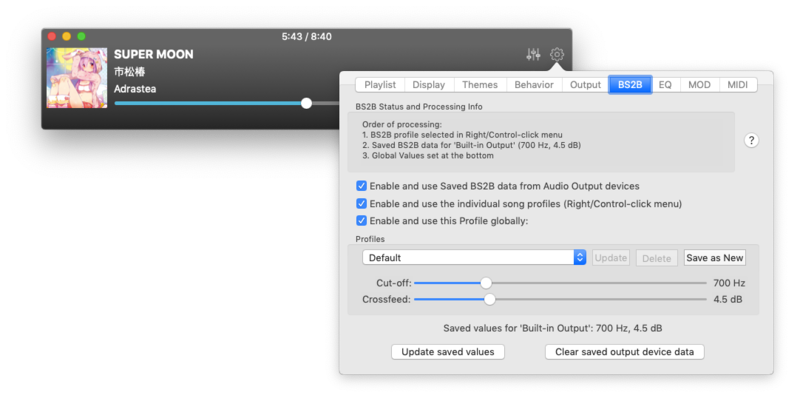 Colibri can place an unobtrusively small icon in the Menu Bar for easy access and playlist control: you can either start/pause the playback, skip to the next track or go back to the previous one. It also displays the info and cover art image of the current song. Control Colibri from even multiple Spaces desktops away with the MenuBar Controller! Colibri conforms all of Apple’s strict requirements – which means that it shows up in Finder as an option in “Open With” when a supported file is selected. Colibri can also open all files of a folder by opening just one of them from Finder – see the Settings – Behavior screenshots in the Gallery. Colibri’s interface elements scale themselves nicely on every screen resolution and pixel density, while Colibri also offers a wide range of usage modes from small condensed to fullscreen complete with multiple types of column layouts and a resizable player window. Colibri is the passion project of Gábor Hargitai, brought to you by countless sleepless and caffeine-induced nights.